A large screening of around 1,000 emerging contaminants, focused on licit and illicit drugs and their metabolites, has been made in urban wastewaters (both influent and effluent) and surface waters from the area of Bogotá, Colombia. After a simple generic solid-phase extraction (SPE) step with Oasis hydrophilic-lipophilic balanced (HLB) cartridges, analyses were made by ultra high-performance liquid chromatography coupled to quadrupole time-of-flight mass spectrometry (UHPLC-QTOF MS) under MSE mode (sequential acquisition of mass spectra at low energy (LE) and high collision energy (HE)). Accurate mass measurements and the information provided by MSE on the presence of the (de)protonated molecule and fragment ions allowed the reliable identification of the compounds detected, even without reference standards being available in some cases (tentative identification). The compounds most frequently found were acetaminophen/paracetamol, carbamazepine and its dihydro-dihydroxylated metabolite, clarithromycin, diclofenac, ibuprofen, gemfibrozil, lincomycin, losartan, valsartan, the two metabolites of metamizole (4-acetamido-antipyrine and 4-formylamino-antipyrine), sucralose, and cocaine and its main metabolite benzoylecgonine. Caffeine, the sweetener saccharin, and two hydroxylated metabolites of losartan were tentatively identified in almost all samples analyzed. Pharmaceutical lidocaine was tentatively identified and subsequently confirmed with reference standard. For the first time, a general overview of the occurrence of drugs and their metabolites in the aquatic environment of Colombia has been reported. In the near future, target methodologies, typically based on liquid chromatography coupled to tandem mass spectrometry (LC-MS/MS), will need to be set up for accurate and sensitive quantification of the contaminants selected on the basis on the information provided in the present paper. 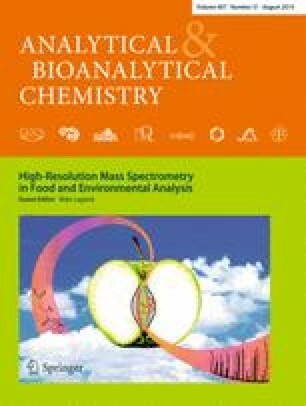 Published in the topical collection High-Resolution Mass Spectrometry in Food and Environmental Analysis with guest editor Aldo Laganà. The online version of this article (doi: 10.1007/s00216-015-8796-x) contains supplementary material, which is available to authorized users. The authors are very grateful to Nubia Irley León and colleagues of Acueducto de Bogotá (Bogotá, Colombia) for providing wastewater samples, Natalia Gonzalez for preparing the wastewater samples, Jose Roberto Vergas for collecting and processing the surface water samples, and Carlos Sales Martinez for making Fig. 1. Furthermore, the collaboration of Juan V. Sancho and Oscar J. Pozo of the Hospital del Mar Medical Research Institute, Bioanalysis Research Group (Barcelona, Spain), for the interpretation of the fragmentation pathways of the losartan metabolites is highly appreciated. This work has been developed under financial support provided by the Plan Nacional de I+D+I, Ministerio de Economía y Competitividad (Project ref. CTQ2012-36189) and the University Antonio Nariño, Colombia (Project ref. 20141082). The authors also acknowledge the financial support from Generalitat Valenciana (Group of Excellence Prometeo 2009/054, Prometeo II 2014/023; Collaborative Research on Environment and Food Safety ISIC/2012/016). R. Bade acknowledges the European Union for his Early Stage Researcher (ESR) contract as part of the EU-International Training Network SEWPROF (Marie Curie- PEOPLE Grant #317205).